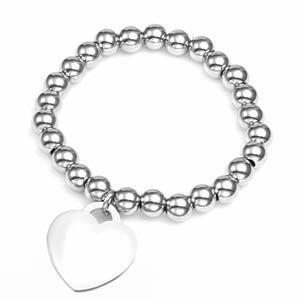 This stainless steel beaded bracelet with heart charm stretches for easy-on, easy-off access. Great for anyone who dislikes dealing with those pesky clasps! For a snug fit, wrist size should match actual measurement of bracelet. For looser fit, wrist size should be 1/2 inch smaller than bracelet length.